This slot, developed by Novomatic, one of the best games providers in the business, summons the devil and all of his demonic minions and power to help you get those desired big wins! After all, what’s the point in playing a slot game if you don’t get wins, even if it is with a little (or a lot of) help from the devil! Playing this slot game will give you the devil’s own luck and you’ll be laughing like a demon as you watch all of the wins come in and increase your credit balance! This is a great mix of classic and unique, with plenty of features that are signature Novomatic features and plenty that are unique to this devilish game! This game is best suited to well-seasoned slots aficionados who know what’s up when it comes to understanding slots and how they work as it might be a bit confusing for beginner slots players. Gamers who enjoy spinning the reels on other Novomatic slots, such as: Book of Ra Deluxe, Haul of Hades and Kingdom of Legend will certainly find this slot enticing, entertaining and rewarding! The devil is in the detail and this is no truer than in Perchta, the demonic slot from Novomatic! There are plenty of unique symbols in this game that feature in this five-reel, twenty-five-payline slot game, all of which have been devilishly designed to fit this slot’s dark theme! The symbols which pay the least in this slot game are the card value symbols from the 10 through to the Ace (inclusive). The symbols which pay the most in this slot game are the gargoyle-inspired, devil-infused face masks which look as though they have been carved by the devil’s hands into wood and brought alive by his evil powers! This game pays from left to right so in order to get yourself a payout, you’ll need to spin three or more identical symbols on one of the twenty-five paylines, on neighbouring reels, starting from the leftmost one. Payout amounts will vary depending on your bet size, and you can see the figures for your current bet if you open the paytable. Bet size can be adjusted by using the controls at the bottom of the screen to increase or decrease the number of lines you’re betting on as well as the amount you’re betting on each of the active lines. 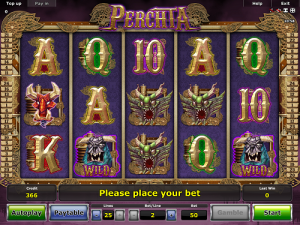 The Wild symbol in Perchta slot game is the devil’s scary-looking sword and this Wild symbol can substitute for any other symbol on the reels, except the Scatter symbol, giving you better chances at getting payouts when it falls on the reels. The Scatter symbol in this game is the devil’s mistress and whenever three or more of her fall on the reels, 6 free games will be triggered which include the soul-stealing feature! During these free games, each of the four higher-paying devilish face mask symbols will have a meter at the top, each with three lights to light-up. Every time the green soul-stealing crystal ball lands on the reels, one of these lights will light-up, starting with the leftmost symbol. Once all three lights for a single symbol have lit-up, that symbol will become Wild and will be able to substitute for all of the other symbols, so you can just imagine how big your wins will get when you manage to get all four symbols substituting for you! Better the devil you know than the devil you don’t, don’t they say? Well, if you like playing Perchta then there are plenty of other Novomatic games, including table games and live casino games, which you can play here at NovomaticCasino.co.uk for free! Why look to another developer when Novomatic’s games are top-quality, generous and entertaining! They’re one of the most popular developers in the industry and once you start playing their games, you’ll easily why this is the case.